Fed up with the daily grind back in 2013 Olie Hunter Smart has spent the last 6 years living a more adventurous life, whilst dipping in and out of a career in marketing. Olie’s interest in travel and culture has seen him throw himself into some serious expeditions, including travelling the length of the Amazon River on foot and by kayak, and his latest exploit, walking 4,500km the length of India. 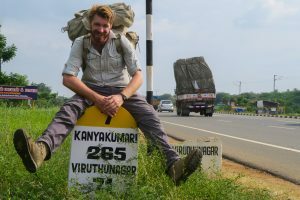 In The Road to Independence we see Olie take on an immense challenge to walk the length of India. A journey over seven months seeking out untold stories of Independence and Partition. His route takes him over gruelling snowy mountain passes high up in the Himalayas, battling intense heat in the northern plains, and being drenched to the bone by monsoon rains as he walks through the rural heartland of the country. Following in Gandhi’s footsteps, Olie immerses himself in the culture, being invited in by so many of the wonderful people he encounters, recording shocking and heartfelt first-hand accounts of India’s struggle for freedom gained 70 years earlier. After the screening we are very proud to have a Q&A session with Olie and a talk about his adventures, covering the making of his first film and what he is planning next. As part of this year’s Herne Hill Free Film Festival we are excited to be partnering with the Maudsley Charity, to help them promote positive change in the world of mental health and to make a real difference to the treatment of mental health in our area. We will be collecting donations at each of our screenings to support their local activities, so if you can, any money that you can spare would be greatly appreciated to help this wonderful charity continue the admirable work they do.